Budi, a Jakarta boy born today in the Bantar Gebang slum could reach age 5 with a healthy start in life in 2020 and be a successful high school student by 2030. Grace, a young girl from rural Papua turning 13 today and coming of age with a high school diploma in 2020 could head a green technology start-up by 2030 on her way to becoming one of the future leaders of her country. This can be the future of a growing number of children in a prosperous 2030 high-income Indonesia. This reality can endow Indonesia with its future entrepreneurs, doctors, engineers, teachers, CEOs, religious leaders and social workers. Based on current realities, the prospects of Budi and Grace could look radically different. Both born to poor parents, they have low chances of evading poverty. Budi faces one chance in 25 to die before age 5, and one chance in 3 to be stunted in his first days of life affecting his brain capacity, future skills and earning prospects. Grace has one chance in 6 to be married before 18 to then drop out of school and become a teen-mom. Both children’s exposure to child poverty, malnutrition, poor health, low quality education, and violence have costs to their bodies, brains, and to Indonesia’s economy now and in the future. In a context of increasing inequalities, all these drivers also increase the risks of disenfranchisement and social detachment that could threaten the stability of the Indonesian society. Which path Budi and Grace find themselves on will depend on Indonesia’s ability to transform the vicious cycle of deprivation into a virtuous circle of prosperity. This is achievable, but requires changing mindsets to see children, their rights and well-being, as foundational to the advance of Indonesia. It requires investing in Indonesia’s most deprived children as a pathway to sustained economic growth and prosperity for the road to 2030. This document shows how investing in Indonesia's children contributes to the Nawa Cita and presents a 9-point roadmap to turn existing commitments into a better future for all children in Indonesia. This roadmap has a level of ambition aligned with the high-income country status Indonesia will have in 2030. It goes above and beyond international targets such as the SDGs. It makes the most marginalized visible as a first step towards inclusivity. Its level of ambition is in synch with the aspiration to lift and sustain national prosperity. Today Indonesia is the poster child of rapid economic development. With the 16th largest economy in the world and the lowest level of economic volatility of all richest countries, today’s prospects are bright. But with the second highest number of people without sanitation facilities and the fifth highest number of stunted children in the world, these prospects may not materialize. An ambitious children agenda offers an opportunity for Indonesia to level up its economic and social indicators simultaneously while contributing to regional and global progress. 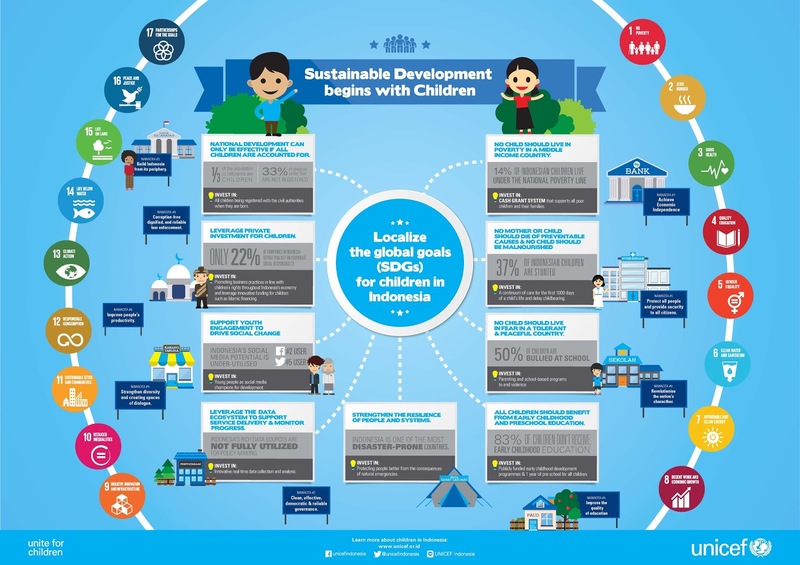 When leaders formally adopt the SDGs at the September 2015 United Nations General Assembly, Indonesia could be the first country whose national development plan incorporates the new SDG targets with a bold agenda for children at its core. When ASEAN countries join the new Economic Community in December 2015, they will face the unique situation of designing national strategies to reach the SDGs in a context of greater economic integration. Indonesia could become the country that leads not only by the weight of its economy, the size of its population and the clout of its moderate Muslim influence, but also by the quality of its child indicators, the ultimate measure of a prosperous society. When the world takes stock of progress towards the SDGs in 2030, Indonesia’s advances will be significant. With the growth of its population and its economy, Indonesia’s progress will also move the needle regionally and globally. Equipped with an ambitious roadmap for children, Indonesia’s footprint will matter for global progress towards international goals and could position Indonesia as the global powerhouse for change China was for the MDGs. Indonesia has one the fastest growth of inequalities in the region. Disparities have a geographical dimension. A child born in a rural area is twice more likely to be involved in child labor than a child born in an urban area. Tanah Papua accounts for 1% of the population but has an HIV/AIDS prevalence 15 times higher than the national average. Disparities also have an economic dimension. A 13 year old from a poor household is 4 times more likely to be out-of-school than one from a rich household. Evidence from around the world clearly shows that there is no sustained growth without reducing inequalities. Specific policies should thus prioritize and accelerate progress for the most marginalized children and young people in the geographical and economic 'peripheries'. The most excluded and marginalized, standing at the “peripheries” of society are often not visible because they are unaccounted for. Today over a third of Indonesian children under 5 are not listed in official records. This stands in the way of their access to school and health services, their benefiting from social programs and being protected from child marriage, while locking them in a status of deprivation and exclusion. In 2030, all children in Indonesia should be accounted for and their births registered with civil authorities. Today, 13.8 million Indonesian children live under the national poverty line of 300,000 IDR per month. This is equivalent to an extreme poverty rate among children of 14.5%. By SDG standard, this number should be zero in 2030. Getting to zero in Indonesia would require a particular focus on those groups of children and geographies most lagging behind. Most countries use two poverty lines to differentiate between extreme poverty and poverty. Indonesia only use the former, but eradicating extreme poverty is not ambitious enough for a middle income country. By doubling its current national poverty line, Indonesia would broaden the ambition of its poverty eradication efforts. Under such standards, 1 in 2 Indonesian children are poor. Setting the target to halve child poverty rate under this line by 2030 would not only be ambitious, it would make Indonesia one of the rare countries with a specific child poverty reduction objective. Investing in a cash grant system that supports primary caregivers of poor children with no strings attached is the way to reach this objective. South Africa started making such investments in 1998 and reduced child poverty by 10% point in the following 10 years. A similar shift is possible for Indonesia. Not only will it benefit the children targeted today but it will also benefit their children tomorrow, maintaining investments in human capital for the next generation. The global estimate of maternal mortality in Indonesia is 359 per 100,000 live births but recent survey data indicate a much higher figure. Moreover, 37% of children are stunted. Children in the poorest households are almost twice as likely to be stunted as those in the wealthiest families and three times more likely to die before their fifth birthday, calling for a particular focus of efforts on the bottom quintile. Stunting has lifelong consequences. It is associated with poor school performance, reduced productivity and reduced income-earning capacity, and increased risk of adulthood overweight and non-communicable diseases. In line with the SDGs, Indonesia should end all forms of malnutrition and the preventable death of mothers by 2030. These objectives should be further specified (e.g., numerical targets for neonatal and child mortality, multiple measures of malnutrition) to capture bolder international standards. They should also reflect the increasing predominance of non-communicable diseases in Indonesia and other middle income countries, e.g., obesity and air pollution-related afflictions. A rapid rise of non-communicable diseases and the high costs of their treatment puts public health care services at risk of becoming unaffordable. Preventive care and the reduction of high risk behaviors early in life are therefore critical. Solutions to get there include strong investments in the continuum of care with a particular focus on the first 1000 days of life of all human beings, and the delaying of childbearing (itself connected to child marriage). Sri Lanka exemplifies how with investments in health systems and human resource capacity this can be done. Children are caught in a cycle of violence in Indonesia where they study, live and play. At school, 36 million of children experience physical attacks by their peers and 85% of school students report physical punishment by a teacher. At home, between 11-22% of young women are beaten, raped or emotionally abused by their partners. This means that of 360,000 the child brides that marry every year in Indonesia, between 30,000-80,000 are at risk of being abused by their partners. Children who witness parental violence in their home are more likely to bully other children at school, experience depression and commit violence against their partners as adults. They are also more likely to drop out of school, be pushed to commit crimes and risk exploitation. Up to $194 billion USD or roughly 2% of GDP is lost as a result of violence in childhood in East Asia in a single year. In line with the SDGs, Indonesia should reduce violence of children by 2030; and end all forms of child labor and harmful traditional practices like child marriage by 2025. Beyond these targets, Indonesia should consider special measures for those children more likely to be victims of violence and abuse: migrant and refugee children, children in institutions and children of religious minorities. Violence in childhood is not a legal problem but a social one. Indonesia's principle of gotong royong, community togetherness, can be transformative to end violence. Investments must be made into parenting programs that help mothers and fathers cope with stress and practice non-violent discipline at home. In Turkey, a mother’s outreach project reduced home physical punishment by 73%. Cash transfers to poor families, anti-bullying programs in schools and more trained social workers are also known to reduce violence. And religious and community leaders, together with parents, must stand together to report violence and champion peace. Only 16.7% of children receive early childhood education and only 60% receive pre-primary education in Indonesia. While we know that education is critical to breaking the cycle of poverty, evidence also suggests that investing in quality education is a cost-effective way to improve adult health and productivity. It also empowers women, reduces violence, and promotes environmental sensitivity. Early childhood and adolescence are two critical windows of opportunity. During early childhood, fast-paced brain development molds the future emotional and learning capacity of human beings. During adolescence, emotional stability, identity boundaries and societal expectations are in flux before they consolidate into adulthood’s value, perceptions and skills. Indonesia should seek to level the playing field from day one, hand-in-hand with a focus on adolescents. Investments in these two transitional phases of human development can help harness the potential of the Indonesian demographic dividend. Indonesia should provide all children with publicly-funded early childhood development and one year of preschool by 2030. Indonesia should also invest in its adolescents, their education and skills, to avoid growing a cohort of disenchanted youth. It should also engage adolescents in developing policies and delivering services that improve their lives. These ambitious objectives will be a fundamental contribution to a smart, healthy and prosperous Indonesia. Indonesia is one of the world’s most disaster-prone country with high occurrence of floods, landslides, strong winds, and drought, all magnified by climate change. Children, especially the most disadvantaged, suffer the impacts of these shocks and crises disproportionately. Policies and investments should help children develop and thrive by reducing exposure to, minimizing the consequences of, and helping them recover from shocks and crises while making their support-systems bounce back better. Services delivery is also challenged by the frequency of disasters the country is exposed to. Even the most efficient social delivery systems can fail when crises hit. Strengthening the resilience capacity of these systems and of those in charge of making them work should be a key priority. Incorporating critical thinking, problem-solving skills, empathy and confidence into education curricula and government staff trainings would strengthen the human dimension of resilience. Designing service delivery chains capable of adapting through crises would strengthen the physical dimension of resilience. This means, for instance, a social protection system with the capacity to expand and contract with the seasonality of droughts and floods, and with the capacity to deploy temporary cash transfers to those impacted by disasters. Indonesia is rich in data, from statistics generated by household surveys to perceptions captured by social media. Yet some gaps exist for certain issues or certain populations, e.g., children with disabilities. They should be filled. The quality of data generated, e.g., by household surveys, should also be improved to increase its validity in view of regional and international standards. Making sure that data and the data revolution benefit children will entail making data transparent, accessible and more inclusive to capture those who are still uncounted, using innovations to speed up data flows, tapping into new sources of data and making sure that data inform policy. Extract more from existing data to better inform policies and service delivery. There is plethora of information on children contained in the hundreds of documents produced to guide and report on national and sub-national plans and policies. Testing the usefulness of text mining, including natural language processing and semantic mapping on this enormous amount of existing text could help the government make better use of its own information base to inform its policy and operations. This could help address some of the bottlenecks generated by a highly decentralized system. Combine data and analytical tools to increase efficiency. New approaches to data collection and analysis can lead to spending less on programs that don’t work – and focusing resources on programs that lead to results. It can also increase the frequency of data (e.g., perception data collected by mobile phone) used to monitor progress towards national and international goals. Indonesia should explore possible innovations through the whole data spectrum: in the most robust data methods, like household surveys; in ‘good enough’, real-time monitoring of action on barriers and bottlenecks and youth feedback/participation; and in using ‘big data analytics’ to achieve new insights. Indonesia has one of the world’s youngest population profiles. Engaging young people in public policy making could be the best defense against more people becoming disenfranchised and disconnected from the public debate. Indeed, engaging them early and often will create a life-long engaged citizenry. Starting from existing youth platforms, strengthening civic engagement of children and young people in different parts of the country could shape a social infrastructure. This is a concrete illustration of building a system of change from the periphery: empowering people who do not traditionally have a voice to have greater say in decisions that affect their lives. Such a platform would provide young people with the power to hold decision-makers to account. ICT tools could help facilitate such engagement, but they are only a start. Decision makers would also need to build the capacity to receive and take action on youth feedback. Build a digital infrastructure of young people for young people. Using mobile technology and building on a partnership with the scout movement, a broad platform of existing youth associations and movements should be created to capture youth voices and ideas on what is working, where and why. It could also be used by young people to monitor progress towards national and international goals that matter to them. Leverage social media. In the Indonesian context of high social media saturation, opening up space for dialogue via social media can incorporate more voices. We know that such an approach will leave some people out; but we also know that in some cases, people are left out when these tools are not employed. Understanding social media for 2-way communication could contribute to strengthening the government’s relationship with children and youth beneficiaries. Indonesia has one of the lowest levels of public health expenditure in the world (1.2% of GDP). Budget allocations should match the level of ambition sets forth to strengthen human capital. Many options are put forward to increase public investments in social services, from increasing excise tax on tobacco to phasing out of fossil fuel subsidies. Businesses and investors should also be enticed to contribute to the future of Indonesia for their own benefit. Businesses will need the skilled and healthy workforce that early investments in education and health can provide. Investors will need the consumers. More socially responsible businesses and impact investments could move the needle for pro-children investments while changing the mindset of large numbers of workers and consumers. Promote the child rights and business principles throughout the Indonesian economy (investments and transactions) from risk assessments and credit rating agencies to sovereign wealth funds and pension funds. Promoting these principles in the social safeguards that should accompany growing infrastructure investments would make a substantial difference. Appointing private sector champions to promote child rights in their respective industries, boardrooms and reporting could be a first step in this direction. The government should also lead by example and integrate child-friendly principles in its own investments and procurement. Tap into Islamic finance and charity. The coinciding growth of the Sukuk market and of impact investment could be turned into a big asset for Indonesian children. The principles behind social impact investment are compatible with the Sharia principles of Islamic finance. So one instrument could be used to strengthen the other. To demonstrate this potential and lead the way in these relatively unchartered territories, the Indonesian government could pilot a child impact Sukuk. In parallel, incentives should be put in place to channel a growing amount of Zakat towards child-focused investments. If implemented, this 9-point roadmap for children would benefit many Budis and Graces in Indonesia. It would also benefit Budi’s and Grace’s children. And it could benefit other children in the world, should Indonesia promote this trailblazing initiative with other countries. The SDGs are universal: all countries will have to translate and tailor them to their national realities. 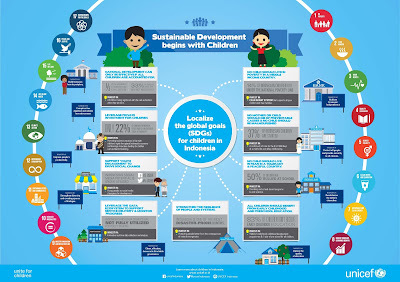 Indonesia should use this 9-point roadmap to showcase how it is done and help shape a global SDG delivery architecture that benefit children now and in the future. National Medium-Term Development Plan - the Rencana Pembangunan Jangka Menengah Nasional ("RPJMN") 2015-2019. According to the 2013 national household survey, the Susenas, just over 60% of children 0-5 years have birth certificates. Department of Social Development, Republic of South Africa. 2011. Impact evaluation of the Child Support Grant in South Africa. Pretoria, 19 July 2011. Powerpoint presentation. Fang, X., Fry, D.A., Brown, D.S., Mercy, J.A., Dunne, M.P., Butchart, A.R., Corso, P.S., Maynzyuk, K., Dzhygyr, Y., Chen, Y., McCoy, A., & Swales, D.M. The burden of child maltreatment in the East Asia and Pacific region. Child Abuse & Neglect, 42, 146-162. The World Bank Group, Op. Cit.